Vi Peels are a noninvasive way to re-texture and brighten the skin. Topical exfoliants are used to lighten sun damage, age spots, and light scarring. This intensified resurfacing action provides measurable results for virtually any skin type. It is helpful for those individuals with facial blemishes, wrinkles and uneven skin pigmentation. The Vi Peel will:Everyone wants to look young and most people will go to extremes to achieve younger, beautiful looking skin. Now you don’t have to. 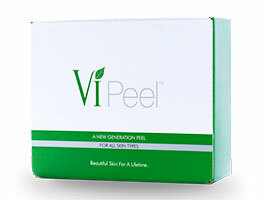 The VI Peel is simple, takes only minutes, is pain free and results are outstanding. The ViPeel has the positive effects typically associated with the more powerful or aggressive peels. However, the Vi Peel does not have the discomfort associated with older more aggressive peels. Most people note that they feel fresher and their skin feels renewed and stimulated by the process. The unique blend of ingredients in the VI Peel produces powerful results with no pain, no skin preparation and very little downtime.